I’ll admit, 10-15 years ago, I was kind of naive about how business worked. I am happy to say I’ve learned a lot over the years, and while still optimistic, the naïveté has tapered off. In 2003, I picked up a book called “Employing Generation Why” by Eric Chester. At the time, I thought it contained some really helpful and insightful information about dealing with the new generation of younger employees entering the workforce. And here’s where the naïveté comes in… I thought people would read this book (or ones like it), figure out the “generations” quagmire, develop some best practices and move on. I really thought once we figured this out we wouldn’t have to talk about it any more. Fast forward to 2018, and we are still having the same conversation about ‘millennials’ that we were having in 2003 (and even before). If history, and the lessons I’ve learned over the last 15 years are any guide, I think the reason were still have the SAME conversation is that it is the WRONG conversation. We keep talking about the differences between generations. Gen X does this, milennials do that. We study the years people where born and the significant world events that likely shaped their way of thinking. Unfortunately, while this type of conversation makes us feel better about our own generation, it does nothing to help build relationships. It allows us to be stuck in the mindset of “my generation is better than yours” . Na, na, nah boo-boo! We also then start to stereotype. Once we put a label on someone, we feel like we know something about them and how they behave, so we adjust our behavior accordingly. Problem is, when you stereotype (based on ANY label) you risk alienating people based on your biases and assumptions. Don’t get me wrong, there are differences in how people of different ages behave and view the world, but those differences exist with people of the same age, too. Putting people into generational boxes is NOT HELPING. That’s why I implore you to remove not only the word “millennial” from your vocab in 2018, but all the useless generational labels that are currently in vogue. Baby Boomer. Generation X. Tranditionalists. The Greatest Generation. Generation Y. iGen. They are all equally useless. And, by the way, made up. There is no official entity that tracks generations. The categorization of generations was made up by authors, management gurus and consultants as way to sell books, management practices and training programs. And it worked, too, because people inherently wanted to make sense of something they couldn’t understand. But we went about it in completely the wrong way, which is why we’re still talking about this today. My mantra when it comes to exploring differences in generations in the workplace is two fold. Get over your preconceived notion that there are these massive gaps in understanding among people of different ages. We all want to be loved, cared for, and to provide value. We also all want to be connected to the outside world, and phones are not the only culprit. Once you make the emotional decision to get over it, to stop dwelling on it, to realize that you just have to deal with reality, then you can do something about it… you can DEAL WITH IT! How do you deal with? By getting to know your employees. By being diligent about teaching them how to be good employees. By understanding that young people (no matter when they walked the Earth) need guidance and encouragement, not a lecture about how you walked up hill to school with no shoes. By the way, I’d like to know exactly when we started thinking that a 15-year old was going to come into the work place with the same skills and work ethic as a 30-year old? That’s what it seems like we are expecting when we complain about “kids these days” always being on the phone and not wanting to work. As I said above, we all want to be connected to something, so why not get your employees connected to your business? Instead of complaining about the phone, give them a reason to not be on it (and it’s not just a policy). Provide a compelling reason for them to concentrate on the work you need them to do and they will stay off their phone. They go to the phone because they are bored, and that’s because WE haven’t given them a reason to care about what they are doing. That’s part of dealing with it… by not just accepting the status quo. Maybe the positions and jobs you have someone doing are outdated? Maybe you need to provide more options for input and self expression? That has to be monitored, and is more difficult than assigning a script, but maybe that’s what needs to happen to engage your employees and keep them off their phones? My friend Josh Liebman tells the story of when he worked at Cedar Point, and most of the attractions had automated spiels. Great for consistency, not so great for encouraging the employees to have fun. They then decided to allow employees to make the spiels live and put their own spin on it… they had fun, added in some coaster trivia and other fun facts, and the guests loved it. That’s probably why a fews years ago I heard an attendant at Gemini doing the safety spiels as Cartman from South Park. It was hilarious. I don’t think that kind of service or experience happens when we put each other into generational boxes. I don’t think it happens when we stereotype and treat the majority based on the actions of the minority. I also don’t think it happens if we don’t get to know your employees and find out what their particular strengths and struggles are. That’s your job as a leader. And if you want to know what your employees want or need, ask them. You won’t find a better resource for what will make them outstanding employees. 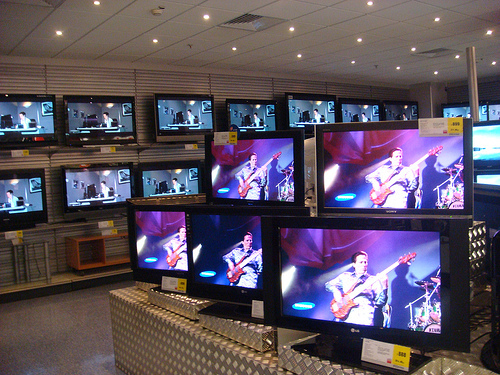 A few days ago, my wife and I were out and about looking for a small TV to put in our home office. We went to two places, and had two very different interactions. Store #1: We saw the model we wanted on display, but could not find a way to obtain it. An employee happened to walk by but didn’t acknowledge us. We asked if he worked there and he grunted in the affirmative. When asked about the TV, he mumbled that they have been out of that model for at least a month, and wouldn’t be getting any more in. We asked about buying the floor model. “Can’t do it.” was essentially the response. When we asked about other models that might have similar features, there was more grunting, and then no. No other TVs they had matched our criteria. We left without a TV, which is why we got to have the second experience. Even though there was no sale made, we can probably all agree that the service was better at store #2 than store #1. Based on all of this, I want to talk about one specific difference in the employees we interacted with. One employee was in his late 50’s or early 60’s. The other was in his mid-late 20’s. The question is: Which store had which employee? If you said that the young mumbler/grumbler was in store #1, you’d be wrong. But you are probably not alone. While I think there is enough evidence out there for these stereotypes to start changing, it’s still the perception of many that young workers are lazy and older workers have a strong work ethic. As a leader, we can’t bank on these stereotypes. If nothing else, these examples show that you can’t judge a book by it’s cover any more than you can judge a generation by what you read in a book. Need to evaluate and improve your customer experience? Mystery shopping (and in-depth report analysis) saves the day! How many “generational” experts have you heard talking about how different the generations are? While it’s true that each generation has their own idiosyncrasies, couldn’t you say the same about genders, races, and socioeconomic classes? But what we have learned (or should have learned) about these other groups? By thinking of them specifically by their stereotypical characteristics, we often get a skewed view of that group, and forget to treat them as individuals. The same thing has happened with all this talk of different generations, and it kind of bugs me. Why spend all this time talking about how we are different? Wouldn’t it be more productive to focus in what we have in common so we can get along better? This “differences are bad” mentality was punctuated by a comment overheard by fellow passengers on a recent Southwest flight. If you aren’t familiar with Southwest’s boarding procedure, they don’t assign seats. Instead, they give you a boarding position, and you stand in line (and then board) according to the position assigned. For this flight, I was B15. “It was probably thought up by some intern“, B14 joked. Why is this a bad thing? Does he think only well seasoned, experienced executives can make good decisions? He seems to be indicating that he thinks interns, by default, come up with stupid ideas, further perpetuating the divide between generations. Well done, B14. Interns and young employees have some great and innovative ideas, and we need to get out of our own way and listen to what they have to say if we are going to lead our teams and companies into the future. The problem is that often their ideas sound so “out-of-the-box” that someone with too much experience maintaining the status quo could never even fathom it working, so it’s called stupid. Of course this goes both ways, young people also still need to listen to more experienced employees to learn from what has happened in the past to avoid previous failures or build on successes. No matter your gender, race, generation or NFL franchise loyalties, one of the things we all have in common is ego. More than any of these other differences, it is our ego that can lead to an unwillingness to admit that someone else might have a good idea. This is REALLY what gets in the way when it comes to listening to each other and building cooperation. So check your ego, embrace the fact that other people have good ideas and intentions, and the “differences” these experts keep talking about will become virtually irrelevant. Did you miss the latest newsletter about spring training (It’s not just for baseball anymore!)? Get your copy by clicking here! Want to be one of the cool kids who gets the newsletter delivered right to you? Click here to sign-up! It’s that simple! So I am very excited and I just have to share… I am in the January issue of FunWorld! (Page 45). It’s a short write-up of the program I did at the IAAPA Expo in Las Vegas. The program was called “A New Generation of Common Courtesy.” (Click here for a sample from the IAAPA website).